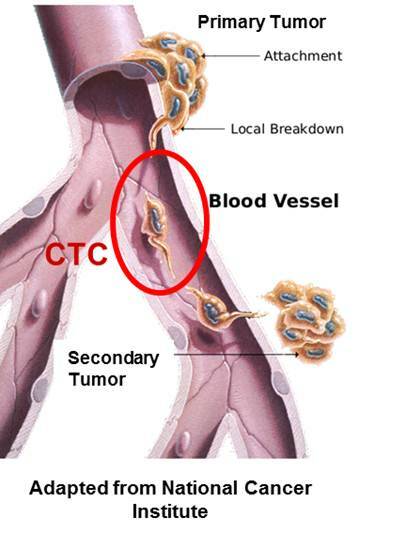 Circulating tumor cells, which play a crucial role in cancer metastasis, have been known to science for more than 100 years. Even though known, scientists have not before been able to track them or isolate them. Now, however, device to do just that are being rapidly developed. These device uses nanotechnology to both efficiently identify and "grab" these circulating tumor cells, or CTCs, in the patient's blood.Metastasis means the spread of cancer from its primary site to other places in the body. It is the most common cause of cancer-related death in patients with solid tumors. Tumor cells are shed from a primary tumor mass at the earliest stages of malignant progression. Some of these cells will travel via the peripheral blood to sites anatomically distant from the primary tumor and form metastases. CTCs escape from the primary tumor settle down at a secondary site to cause metastasis. As individual cells present in low numbers, such disseminated cells can be hidden to standard methods of investigation such as microscopic examination of routinely stained cyto/histology slides. Nevertheless, these cells are a major concern as a source of eventual lethal metastases, the major cause of treatment failure in cancer cases. The current gold standard for determining the disease status of tumors involves the invasive biopsy of tumor samples, but in the early stages of metastasis, it is often difficult to identify a biopsy site. By capturing CTCs in blood samples, doctors can essentially perform a "liquid" biopsy, allowing for early detection and diagnosis, as well as improved monitoring of cancer progression and treatment responses. If more studies confirm the technology’s effectiveness, doctors will be able to access and identify cancerous cells in the bloodstream. Identifying cancer cells present in the bloodstream will give the treating doctor to individually tailored treatments for patients and decrease the chances of metastatis. It promises a powerful new tool for future cancer early diagnosis, treatment and management to enhance survival. If you feel that your cancer diagnosis was mishandled by a medical professional you may be entitled to compensation. Even the best hospitals in the state of Pennsylvania, including UPMC Children's Hospital of Pittsburgh, UPMC Mercy and UPMC Presbyterian Shadyside have had medical malpractice cases arise from within. If you believe you have been a victim of medical malpractice in Pittsburgh, PA contact the skilled Pennsylvania lawyers at Berger & Lagnese, LLC. Our office is located at 310 Grant St #720, Pittsburgh, PA 15219 and consultations can be scheduled either online or by calling (412) 471-4300.